On August 12, 2017, few Circassian youths were arrested on the Black Sea coast, in the resort town of Gelendzhik. They were simply dancing Circassian national dances. A video proves the detention that took place by the Russian police. The youths organised their dancing with absolutely nonviolent, peaceful manner and without disturbing anybody. They didn’t provoke any interethnic conflicts, because the were simply enjoying their time, while local residents were clapping and rejoicing with them!!! Then came the local Russian “valiant police”!!! The Police and local Cossacks started creating chaos, and began to create violence with the Circassians to try twisting facts. Some guys were knocked down and beaten, while another guy, got his face splashed with Pepper Spray. The young Circassians were dealt with inappropriately! 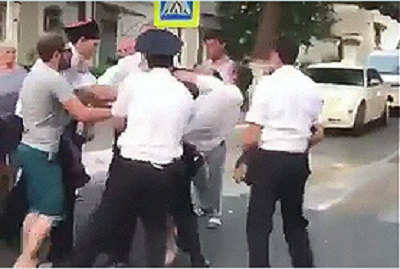 All Human Rights organisations and activists are urged to pay attention to this kind of brutal behaviour that the Russian police and other security services’ agencies have adopted and conducted.